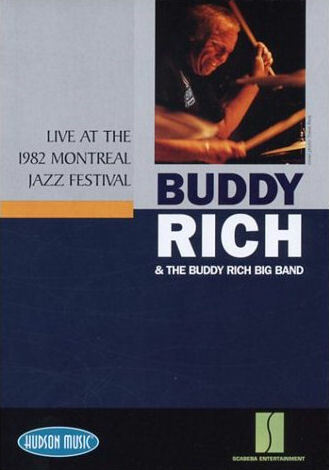 Tiger Bill's review of Buddy Rich and The Buddy Rich Big Band Live at the Montreal Jazz Festival 1982. I was first introduced to Buddy through TV variety shows like Merv Griffin and Mike Douglas. When I was 13 years old my dad took me to see Buddy with his Big Band at the famed MeadowBrook in NJ. From that moment on, I was hooked. Buddy seemed to have it all - speed, power, control, endurance, finesse, you name it and Buddy had it. He was one of my major influences and one of the reasons that I became a drummer myself. For pure drumming energy, excitement, and pyro-technics, no one affected me quite like Buddy Rich. This Hudson Music release captures Buddy in 1982 at the age of 65, what some people would consider retirement age. But not Buddy! He just kept getting better with age. When Buddy passed away in 1987 he left us much too soon but, thanks to the folks at Hudson Music, we have DVDs like this one to remember him by and to introduce him to new generations of drummers. This DVD features seven tunes from the 1982 Montreal Jazz Festival plus a rare bonus performance from 1972 of Buddy playing the jazz classic Green Dolphin Street. Included is a free bonus audio CD that contains the seven songs from the Montreal Jazz Fest. The songs are Hookin It, Brush Strokes, If They Could See Me Now, Good News, West Side Story Medley, Carioca, Time Check, and Green Dolphin Street. The musicians consist of Trumpets: Dave Stahl, Doug Clark, Chris Pasin, John Harbaugh; Trombones: Peter Enblom, Ken Crane, Pete Beltran; Saxes: Steve Marcus, Mike Smith, Andy Fusco, Walt Weiskopf, Keith Bishop; Piano: Lee Musiker; Bass: Mike Boone. This DVD, from Hudson Music and Scabeba Entertainment, contains a rare example of Buddy's expertise with brushes and also includes his classic West Side Story Medley complete with extended drum solo. The Bottom Line is that this DVD (with free bonus audio CD) is a must have not just for fans but for all DrumHeads, regardless of drum style, who want to experience a true drumming genius at work! Copyright © 1998-2013 by TigerMix.com, Inc. Unauthorized reproduction without permission is prohibited except as noted.